Clarke thrilled by Open return, but can Rory shoot 61 on new Dunluce? Darren Clarke confessed that never in his wildest dreams could he have imagined the Open Championship retuming to Northern Ireland during the “dark days” of the Troubles. But with the R&A announcing at Royal Portrush yesterday that the 148th Open will be played over a redesigned Dunluce links from 18-21 July 2019, the 2011 Open champion believes the “biggest and best tournament in the world” will be played on a course that will soon be considered one of the Top 5 on the planet. It is now highly unlikely that Rory McIlroy will bring this newly redesigned Dunluce Links to its knees with a repeat of the 61 he shot as a 16 year old in 2005. Back then a 61 was 11 under par. Now that the course has two new holes and a host of other changes, it's a par 71 measuring 7,337 yards from the tips. He expects the revamped course to become one of the world’s best, insisting: “If it is not ranked amongst the Top-5 after these changes, I will be amazed because this is as fair a links course as you will ever play." The changes to the course are huge but it's the reality that Northern Ireland will host an Open just days after Marching Season and only a few years after the bloody sectarian conflict that left 3,500 dead that left the Dungannon native pinching himself. Clarke said: “I knew it had been here at Royal Portrush before. Did I think we would get through the dark times that Northern Ireland has had to get the biggest and best tournament in the world? I’d be very foolish to say yes. He pointed to three major wins by Padraig Harrington, one of the biggest fans of Royal Portrush, from followed by European Tour chief George O’Grady’s decision to take the Irish Open to Portrush in 2012 as the two big keys to the R&A’s decision. “I think George O’Grady deserves the credit for that,” Clarke said of the sellout Irish Open of 2012 that persuaded the R&A to consider Royal Portrush for The Open. Now a Portrush resident and with his Silver Medal and replica Claret Jug on display in the Royal Portrush clubhouse, Clarke talks with the pride of a local of the changes being made by architect Martin Ebert to the masterpiece left behind when Harry Colt revamped the course in 1932. His quip drew laughs from the assembled dignitaries that included Acting First Minister Arlene Foster and deputy First Minister Martin McGuinness, who are expecting a tourism bonanza to the tune of £70m from the 2019 Open alone. 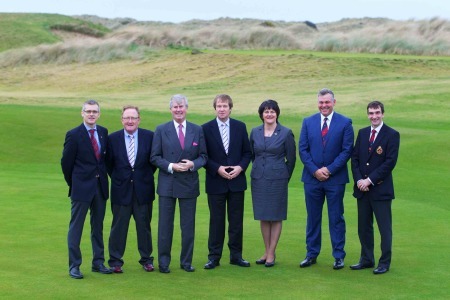 In praising Foster, O’Grady and the formidable Royal Portrush secretary manager Wilma Erskine for their work, Clarke singled out former R&A Chief Executive, Peter Dawson for praise. While the tournament looks likely to return every nine or 10 years for at least two more editions, Dawson’s successor as Chief Executive, Martin Slumbers, was happy only to confirm 2019. “The best way to get a harder decision (on coming back) is to have a fantastic Open in 2019,” Slumbers said. He also said the R&A was no looking at any venues, in Ireland or the UK, to add its current rota of 10 courses, which is bad news for Wales and Royal Portcawl. A large number of road works are already visible on the run from Ballymena to Portrush but whatever about the logistics of the venue, the course will provide a very stern test indeed. With the current 17th and 18th holes on the Dunluce Links to be used for site the tented village, two new holes have been created on the adjoining Valley Links, the new par-five seventh (572 yards) and par-four eighth (435 yards), with the Championship finishing on the current 16th. The work is due to be completed by the middle of 2016 with the two new holes being given time to grow-in ahead of the following season. McIlroy, who shot an 11 under 61 over the Dunluce Links as a 16 year old in the 2005 North Of Ireland Championship, welcomed the news. But while Clarke did not dare suggest that the changes will “Rory-proof” the track, he certainly believes that another 61 by the former world No 1 would be well worth watching. He expects the revamped course to become one of the world’s best, insisting: “If it is not ranked amongst the Top-5 after these changes, I will be amazed because this is as fair a links course as you will ever play. “Going back to the Irish Open in 2012, for players to have it as their favourite tournament, blowing a gale in pouring rain, speaks volumes about the course. “When I looked at the changes initially, I was skeptical. But whenever I went round with Martin and he explained them to me, I could really understand them. “The more I looked at them, I thought, that’s going to make this even better. There is a difference between making it better and making it tougher. He is making it better. That is the difference. The Irish Open will not return to Royal Portrush until 2020 at the earliest while the North of Ireland Championship will be played on another links next year and in 2019. Asked if the 2017 Irish Open was in danger of no going ahead at the Enniskillen resort in her native county, as announced last year, Acting First Minister Foste said: "I wouldn't say that You'll have to ask the European Tour. The announcement has been made. The expectation is there. Certainly all of the agencies are working towards 2017. Nothing has changed, or you would know." Talk in industry circles a links swing of Irish-Scottish and British Opens championships in consecutive weeks would require new links venues to come into the Irish Open rota and the French Open's date on the calendar. With the Irish Open's prize fund rising 60 percent this year to €4m, the Irish Open is becoming a hugely important event in the European Tour calendar, even more so with new CEO Keith Pulley declaring that tournament host McIlroy is the tour's most valuable asset. Every top rated links in he county is now a contender with the likes of Porstewart and Castlerock in Northern Ireland joining Royal Portrush and Royal County Down as possible venues. In the Republic, Portmarnock remains the elephant in the room over it's men only status though it's being suggested that the European Tour's blue chip sponsors such as BMW and Rolex who have more difficulty with a men only club the the irish government. With the K Club a one-off venue this year — a convenient stop over as the Irish Open reaches a crossroads — the list of pretenders for the Irish Open south of the border varies from the parkland staples such as Druids Glen, Mount Juliet and Fota Island, to the links with clout. Venues such as Doonbeg, Ballybunion and Tralee are improving their facilities while Co Louth has also undergone several improvements since it last hosted the Irish Open in 2009. The arrival of The Open certainly does Ireland no harm as a golfing destination and the changes to the Dunluce Course sound and look hugely promising. Clarke was initially unsure about the proposed changes until Ebert gave him a tour and explained each one in detail. "Ir was only a couple of bunkers here and there," he said of his early misgivings. "I was probably being a little bit selfish because that is where I hit it all the time. There were a few changes that for someone like myself who has played the golf course for so many years, they force me to think differently on the tee. So as opposed to being aggressive and taking a little bit of a gamble, there is going to be too much trouble. The fifth, for example, with those two new bunkers going in there (down the right)." "The seventh (572 yard) is going to be a great par five. The second is currently a short par five but it it going back 40 yards (577) and that’s going to improve that. The 10th, which they are going to play as a par five with the hazard opening in front of the green with a new tee, making it a risk-reward second shot. "You have the new seventh, which might not be in range and with the Big Nellie bunker we are losing on 17, to replicate that (on he new hole) is a wonderful idea. The new eighth (435) is going to be tough depending on where the wind is coming from. There is a area where it is 280 carry and into the wind, if you don’t make the carry, that’s trouble. Or your can take the 230 carry and bail out right but you are going to have a brutal second shot into a very narrow green. All in all, I can’t praise Martin Ebert high enough for the changes he is making. It is a modern lift to one of the best courses in the world." Asked about the return of the Irish Open being delayed now until 2020 at the earliest, Clarke saidL "It will come back here again and whenever the boys do come back and see all of Martin’s changes. they will really enjoy it. I think the players. when they get here and play The Open here, as well as being the biggest and best tournament int he world, they will enjoy it and enjoy the area as well." Darren Clarke during the final round of the 2011 Open in Sandwich. Picture Credit / Phil INGLIS / www.golffile.ieDarren Clarke’s Sandwich feast has made him vow to change from Mr Flabulous into Mr Fitness so he can add to his major haul. 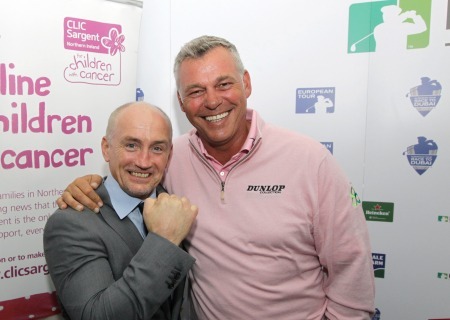 CLIC Sargent Patron Barry McGuigan and Darren Clarke at the Irish Open Media Day where The Darren Clarke Foundation announced its support of CLIC Sargent, the official charity of the 2012 Irish OpenCrocked Darren Clarke insists he’ll play “on a zimmer frame” if that’s what it takes to make the Irish Open a massive success and boost the chances of bringing The Open back to Royal Portrush. Darren Clarke might be making his 500th European Tour appearance in his 12th Masters this week but he’s got his sights set on a little but of Irish luck for Royal Portrush with hopes that the Open Championship will be heading across the Irish Sea growing stronger by the day.